The front entrance to Monticello Seminary (later Lewis & Clark College). A panoramic photograph taken during the heyday of the school. Monticello College was founded in 1838 by Captain Benjamin Godfrey, a pioneer financier of the Alton area and a former sea captain. Captain Godfrey was a well-liked, adventurous man and in light of his earlier career, it is somewhat surprising that he would found a college for "females", especially at a time when it was almost unheard of for a woman to attend school at all. Godfrey was an uneducated Cape Cod shipmaster who had sailed the seven seas and had never seen the inside of a college building before coming to Alton. He did, however, have nine children, and one morning, overheard one of his daughters imitating her mother. As he then put it, "Educate a man and you educate an individual, educate a woman and you educate a family." Godfrey had been born in Chatham, Massachusetts in 1794 and went to sea as a boy, where he gained a practical education and a knowledge of navigation. In addition to learning about the sea, he also gained a knowledge of business. After a merchant vessel under his command was shipwrecked, Godfrey was stranded in Mexico. He took advantage of the opportunity and opened a mercantile business in Matamoros. He accumulated more than $200,000 and was transporting it by mule when he was attacked and robbed. He lost all of his money but traveled on to New Orleans anyway, and then upriver to Alton in 1832. Prior to opening the school, Godfrey had amassed a considerable fortune through business dealings in the Alton area, mostly in connection with Mississippi River steamboat traffic. He and an associate were the heads of the newly chartered Alton State Bank and his business dealings had put him into partnership with a close friend named Winthrop S. Gilman. The firm prospered and was known up and down the river. It was in the Godfrey, Gilman & Co. warehouse, on the Alton riverfront, where Elijah P. Lovejoy hid his printing press and was murdered in 1837. After leaving the banking business, Captain Godfrey became a railroad promoter and built the line between Alton and Springfield. During the construction, he lived in a railway coach and followed the work as it progressed. When the railroad was completed, Godfrey returned to his stone mansion on the outskirts of Alton and once more devoted himself to the Monticello Female Seminary. He contributed over $110,000 to the founding of the college and would remain a trustee of the school until his death. Godfrey chose Reverend Theron Baldwin, a Yale-educated minister, to be the first principal of Monticello, which was now being called the first "female seminary in the west". Baldwin had also been instrumental in founding several other Midwestern colleges, including Illinois College at Jacksonville. In 1838, most girls' schools were merely finishing schools that emphasized music, needlework and other "womanly arts". The goal was a good marriage. However, at Monticello, the ladies were actually given a higher education. They studied difficult courses in mathematics, English, history, religion, philosophy, foreign language and music. The goal was still a good marriage, but the faculty at Monticello was determined the ladies would learn something as well. For 50 years, the plan had flourished, right up until a terrible fire in 1888 that threatened to close the school for good. Two weeks later though, re-building was already under way. The camaraderie between the students and the staff, created by the fire, intensified the school spirit and the feeling of family at Monticello. This was a feeling that would last until the school closed down in 1971. After Theron Baldwin retired, he was replaced by Miss Philomena Fobes, who continued the original plan for the school through the Civil War. As the college grew, it began to gain national notoriety and attracted students from all over the country. During the Civil War years, the campus became bitterly divided as girls from both Union and Confederate families attended Monticello. However, in 1867, Harriet Newell Haskell arrived as the new principal at Monticello and quickly mended the rift. She devoted the next 40 years to making the school one of the most respected female institutions in the country, battling everything from a shortage of funds to the tragic fire of 1888. Harriet Haskell had been born in Waldoboro, Maine in 1835. Always regarded as a tomboy, she was a favorite companion of both the boys and the girls of her neighborhood. She had a fertile imagination and was educated at Castleton Academy and Mount Holyoke, then went on to become the first female headmaster of the Franklin School in Boston. She would also be named as president of Castleton and when she was first asked to come to Monticello, she refused. Strangely, as the school would later inspire so much devotion from her, she made her decision after visiting the college and found that it wasn't to her liking. The Monticello board elected her to the job, despite her refusal, and this time Miss Haskell accepted, perhaps seeing the school as a challenge that she could meet head-on. The students at Monticello took to Miss Haskell right away, perhaps because of her wit and her sharp sense of humor. She was also an early advocate of sports for women, believing that if they were well off physically, they would be fit emotionally and morally as well. The great fire of 1888 became a history-making event for the school and in lesser hands, the seminary would have closed down for good. For Harriet Haskell though, it was merely a minor setback. Even so, it nearly had tragic consequences. The fire began on November 4, a quiet fall evening. Standing on the campus and looking at the five-story stone building that night, a visitor would have never suspected that anything was amiss. In fact, the college, with its looming tower, stately trees and shadowed walkway was the model of silent serenity. But within a few short hours, all of that would come to an end with a fire that would sweep through the college and destroy the dormitory and the classrooms. No one was injured in the blaze but it nearly wiped out the entire structure, little of which was covered by insurance. The fire, which started in the laundry room ovens, awakened the servants first and in a panic, they sounded the alarm throughout the building. Almost 130 young women were asleep in the building at the time and they were soon roused from their beds. An alarm was sounded and people from all over the community, in wagons, carriages and on foot and in all manner of dress, began to arrive to help put out the blaze. As word spread, residents from Alton began arriving as well. Meanwhile, Harriet Haskell stood calmly in the doorway of the dormitory, carefully inspecting each of the girls as they rushed from the building. She made sure that each was properly dressed and in clothing befitting a Monticello lady. A few of them returned to their rooms for proper attire, as they were well aware of Miss Haskell's standards of propriety. Several of the students also managed to drag their heavy trunks and bedroom furnishings downstairs and out the door. Arriving volunteers who realized that the buildings were a lost cause, began helping the ladies to salvage their personal items instead. Fortunately, Miss Haskell's rooms were next to the front doors, so the men were able to slide her collection of rare books down boards that were propped up to the windows. They even managed to save her piano, which was taken over to the Godfrey Congregational Church for safe-keeping. Other volunteers ran from room to room, wrapping the ladies' belongings in bed sheets and tossing them from the open windows. Eventually, even these efforts had to be abandoned when fire fighters mounted the roof to chop off a wooden drainpipe that was being engulfed by flames. As they clambered onto the roof, it collapsed and all of the men were almost killed. When the fire was over, all that remained of the "first female seminary in the west" was a pile of smoldering embers and a hollowed-out and blackened shell that was once the tower. Later that morning, a large wagon arrived, loaded with empty trunks, and the ladies were instructed to choose one and to place their salvaged possessions inside. The trunks were then shipped home. One of the trunks, belonging to a young lady who followed Miss Haskell's instructions to the letter, had only a single rubber boot inside. The ladies were all sent home and as they departed, they looked back to see Miss Haskell standing on the college lawn, staring at what remained of the beloved school. Few of them honestly believed that they would ever see the seminary, or Harriet Haskell, again. But anyone who thought the school would close down had sorely underestimated the iron will of Miss Haskell. She immediately began a spectacular fund-raising campaign for the school, collecting thousands of dollars and launching a new building called Caldwell Hall, which was designed by the architect of Union Station in St. Louis, Theodore Link. In a short time, the college was up and running again and by 1902, Miss Haskell announced that the college was officially out of debt. Although she never married, Miss Haskell raised two nieces and purchased a Federal Style home on campus, called the "Evergreens", in the 1890's. Although she may have never raised daughters, many students at Monticello left with the feeling that Miss Haskell had loved them as much as she would have her own children. She was often described as "an educator who had no superior among ladies in similar positions throughout the land. She was not only an educator, but also a vital, uplifting force to the students, and also their tender, sympathetic friend." Miss Haskell began a reign at Monticello Seminary that would endure for 40 years - and some believe that it has never ended. Her tenure as the head of the college was the school's highest point, both by educational standards and financially. She had a real knack for securing donations for the school and was respected by parents and board members alike. She was also adored by the students and when she died, the "Haskell Girls", as they called themselves, were deeply grieved. Former students from across the country sent flowers and cards and came from great distances to attend her funeral. Miss Haskell's tenure was followed by that of Miss Catherine Burrowes, but things were never the same again for many of the girls. The school would never again achieve the fame that it had when Harriet Haskell was alive. It did continue to grow and prosper for some time although eventually, time and co-educational colleges caught up with the school. The last class graduated from Monticello in 1971 and the campus became the home of Lewis and Clark Community College. Much of the campus has since been renovated and what used to be dorm rooms are now offices and the old school chapel is now a library. While many things have changed at the college, others have remained the same. One of those things is the presence of Harriet Haskell. Her days at Monticello may have ended in 1907 - but some people insist that she is still present, at least in spirit. In 1971, on the day Monticello Seminary officially became Lewis and Clark, one of the largest and oldest trees on campus crashed to the ground. There was no storm, high wind or act of nature that day for some say that it was Harriet Haskell, upset over what had become of her beloved Monticello, who knocked down the tree. Others are not so sure. "There are believers, non-believers and those who are neutral about the existence of ghosts," said Lars Hoffman, a Lewis and Clark professor and former Godfrey mayor, in an interview. Hoffman is considered an open-minded skeptic about the haunting of the college, but he does collect stories about the ghost of Harriet Haskell and alleged encounters with her spirit. Whether or not the ghost is real, the legend is a huge part of the tapestry of the college. Believers are said to speak in quiet voices about the ghost and the non-believers, well, they refuse to acknowledge the stories at all. The college has no official stand on the haunting but consider it simply a part of the school. "The Haskell legend is as much a part of the school as the books and buildings," said Hoffman. The stories about Harriet Haskell's ghost actually began long ago, shortly after her death in 1907. At the time, Monticello girls were scaring the new students with tales of Miss Haskell's ghost, wandering up and down the hallways at night. Others told of seeing her face reflecting back at them from mirrors and of seeing apparitions in darkened corridors. 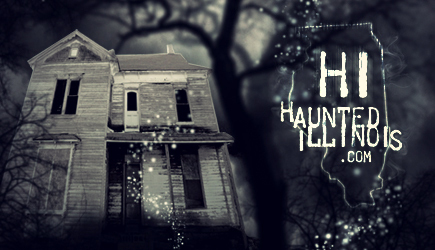 Were the ghostly tales of Harriet Haskell merely legends to frighten new arrivals at the school? Perhaps - or perhaps not. Along with these chilling stories were events not so easy to explain away, like the fact that the oldest house on campus had lights and fountains that would periodically turn on and off by themselves. There was also the steam-operated elevator in the old administration building that would suddenly start up and run by itself. The security guards would discover that no one was in it, however it would mysteriously travel between floors at night. As time passed, more and more people were encountering odd occurrences and even apparitions of Miss Haskell herself. Others were reporting the fact that lights were turning on in empty rooms at night and that water would sometimes run in the bathrooms for no reason. 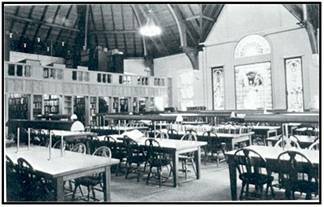 One of the most haunted places on campus is the library, which was once the Monticello chapel. It was said this was Miss Haskell's favorite room. It is an incredibly beautiful place and it is not surprising that compulsory chapel was held each day. It is in this room where the spirit of Harriet Haskell is encountered the most. A librarian who was working alone in the room one night claimed to feel someone touch her on the shoulder. When she turned around to see who it was, she found that no one was there. She turned back to her work and again, felt a hand tap her arm once again. This time, after finding no one was there, she closed up and went home. The woman later stated that while she does not believe in ghosts, there was something in the library with her that night. She was positive that someone tapped her on the shoulder. Another recorded sighting of Harriet Haskell was experienced by a separate librarian. She was straightening magazines in a recessed corner nook one night and looked up to see a tall woman in a long-old-fashioned dress standing near the main desk. Before she could speak and ask the woman if she needed assistance, the specter gradually faded away. One Halloween night, a student, who was very skeptical about ghosts and the supernatural, decided to do a radio broadcast from the library. He set up his equipment to air a reading of some of Harriet Haskell's writings, read aloud by a speech professor. The radio crew was set up at one of end of the room and the professor was at the other. The lights had been turned down very low making the library quite eerie, even to those who were non-believers. Around midnight, the student signed off the air and was shutting down the transmitter. He had just flipped off the switch when he felt a cool hand touch him on the shoulder. He turned quickly and when he found no one was there, he figured that one of his buddies was playing a trick on him. He pulled off his earphones and grabbed a flashlight. Quickly, he searched the library, guessing that he would find someone sneaking out. Strangely, no one was there. He came back and sat down again and put the headphones back on. He didn't want to admit, even to himself, that he was rattled, but he was. His hands shook a little as he turned the dial for some music and little by little, he began to relax. Or at least he relaxed until he felt that familiar hand on his shoulder again! This time, he tore the headphones from his head and leaving all of his equipment behind, he ran headlong out of the library. Another haunting attributed to Miss Haskell, which also occurs in the library, is the overwhelming smell of lilac perfume. It seems that that Miss Haskell's trademark scent signals the fact that her presence is near. Many people have encountered this scent over the years, including many who either disbelieve or have no interest in ghosts at all. Is this simply their imagination at work? "I don't believe in ghosts at all," one former student told me, "but I can't explain that smell. I didn't find out until later that lilacs were supposed to mean that Harriet was around - and I didn't like it much when I found out either." So, is Lewis and Clark College really haunted? I will leave that up to the reader to decide, but before making that judgment, let me leave you with one more tale from the school. Over the years, I have heard literally hundreds of stories of ghosts, hauntings and strange encounters that have been experienced by ordinary people. Of all the stories I hear, the most convincing ones remain those which are told to me by people who profess to not believe in ghosts, who are skeptical of anything which reeks of the supernatural, or who have no more interest in the paranormal than most of us have in the feeding habits of saltwater fish. These are the most chilling tales because those who tell them simply have no earthly explanation for what has happened to them. This was the case one afternoon in the early 1990's when the maintenance staff at the college received a call from a campus security guard. One of the new elevators had gotten stuck between floors with a female student inside of it. Could they please come over right away and get it working again? The young lady inside of it was becoming very agitated and was crying for help. Two maintenance workers came over and set to work on the elevator. The woman inside constantly called out to them, very upset, asking them to hurry. After several minutes, she began to cry. The maintenance man who was working with the electrical panel worked as fast as he could and finally, he had it fixed. They brought the elevator down to free the trapped woman. The doors opened and they waited for her to step off. When no one came out, they looked inside - the elevator was empty! There was no young woman inside of it, even though the car had made no stops before opening up. The maintenance men, and the security guards who made the call, swear to this day they had been talking with the woman inside of the elevator - even though no one was there!